NOTE: These screen shots are from version 1. The youtube videos linked above are more recent. I have recently uploaded a small plug (called BGII) which, among other things draws perspective guide lines on a canvas. When first run, the plug in creates a path with three control nodes (open the paths dialog to see it). On second (and subsequent runs) it draws the perspective lines based on the location of these control nodes. If you get in to any problems, delete the path and start again. Run the script again to get these perspective lines (takes a few seconds on my machine). Each of these sets of guides is created in a separate layer. The layers can be switched off independently. Similarly you can set opacity separately for each set of guides. 1. Download a copy of the plug in from http://registry.gimp.org/node/28413 At the moment (September 2013) the most recent version is at http://registry.gimp.org/files/bgii.py_1.txt, but check in the future if that’s still the most current version. 1. Sorry, can’t really help with this (if you know, please add a comment). Try generic instructions here (first site I found using Google). 5. click somewhere on the red path (should be two lines one across the middle from left to right, then from there to the mid point on the top of the canvas). This should show the vanishing points (white circles) and make them available to move. 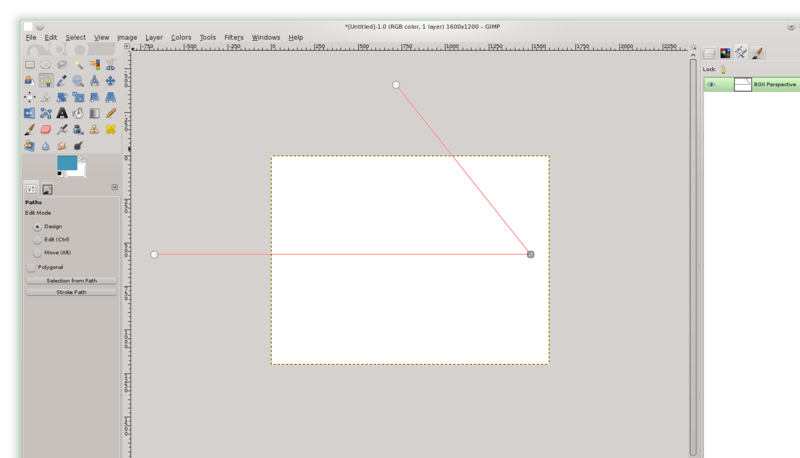 6. click and drag to move the vanishing points to where you want them. Zoom out if you need more space. 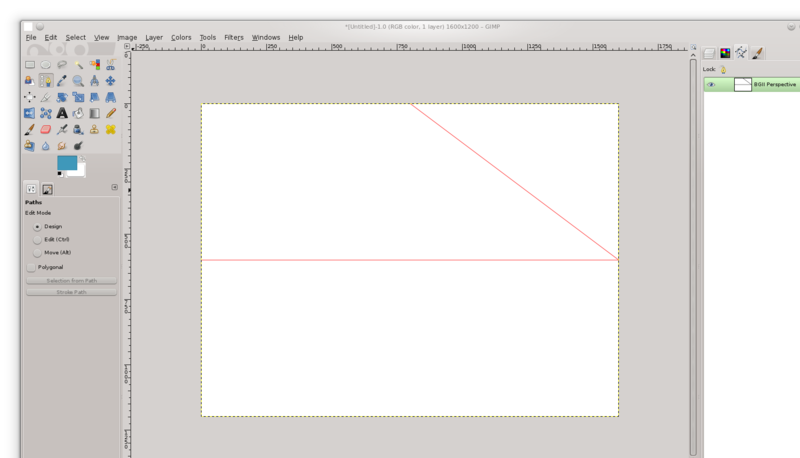 7. choose tools->BGII->Perspective Lines -> Update This draws the perspective lines. If it doesn’t work first time, just click it again. On my machine it takes maybe 4 or 5 seconds. 8. Open the Layers dialog (Ctrl-L or windows->dockable dialogs-> layers). At the top, there will be a layer group called BGII Perspective. 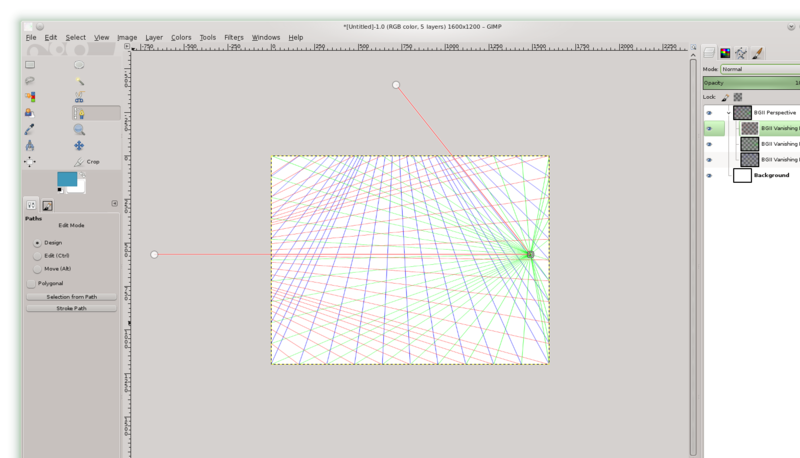 It has three layers in it called BGII Vanishing Point 1 , 2 and 3 respectively. Use opacity slider and visibility toggle to suit. 9. For a different set of perspective lines – repeat 4-7. This deletes the existing perspective layers and redraws them. Surely, if it’s done nothing wrong it has nothing to hide…?